Musorgsky’s opera begins at the time of Boris Godunov’s accession to the throne in 1598. His reign was plagued by controversy and ended in violence. Variously vilified, praised and excused ever since, Boris and his legacy have been much debated – and have also inspired some great works of art. Boris did not come from a princely family. In 1580 his sister Irina married Tsarevich Fyodor, Ivan the Terrible’s younger son. The death of Ivan’s eldest son the following year left Fyodor as the heir to the throne. In 1582 Tsar Ivan had another son, Dmitry, by his seventh wife. Fyodor succeeded Ivan the Terrible in 1584. Since Fyodor was both mentally and physically feeble, his brother-in-law Boris Godunov came increasingly to act as regent. In 1591 Tsarevich Dmitry was found dead in the courtyard of his palace at Uglich. A commission of enquiry concluded that Dmitry had cut his own throat with a knife in the course of an epileptic fit. In spite of the official verdict, popular rumour held Boris responsible for the tsarevich’s death. In 1598 Tsar Fyodor died childless. The throne passed to Fyodor’s widow Irina, but she chose to become a nun. In an unprecedented move, Irina’s brother Boris was elected tsar. Tsar Fyodor’s death reminded Russians of the mysterious death of Tsarevich Dmitry, and rumours began to spread that Dmitry might still be alive. In 1604 a young man claiming to be Dmitry invaded Muscovy with a small army. ‘Dmitry’ suffered a military reverse at the hands of Godunov’s commanders, but in April 1605 Boris died suddenly in Moscow. His inexperienced teenage son Fyodor was proclaimed tsar, but Boris’s generals defected to the pretender. Dmitry’s reign lasted only a few months before he in turn was overthrown and replaced by Prince Shuisky. Shuisky’s legitimacy as tsar was never universally recognized, and between 1606 and 1612 Russia was plagued by the ‘Time of Troubles’. Shuisky had insisted that Tsarevich Dmitry had really died at Uglich, murdered on Boris’s orders. 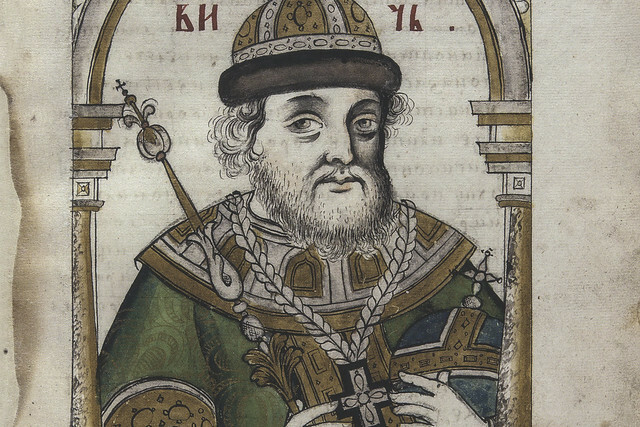 Dmitry of Uglich was consequently canonized by the Orthodox Church; and the corollary of his canonization – that Boris was the killer of a saintly prince – remained the official position of Church and state throughout the tsarist period of Russian history. Nikolay Karamzin, the first serious Russian historian, followed the official line about Boris’s responsibility for the death of Tsarevich Dmitry, but he presented Godunov as a tragic hero rather than a villain. In Karamzin’s account, Boris’s guilty conscience over the death of Tsarevich Dmitry meant that when he became tsar he felt insecure on the throne. His insecurity took the form of persecution of real and suspected rivals: Boris became a tyrant. Alexander Pushkin’s play about Boris Godunov, written in 1825, was heavily based on Karamzin’s History of the Russian State. For Pushkin, too, Boris was guilty of Dmitry’s death and suffered pangs of conscience. In Musorgsky’s opera, based on Pushkin’s play, the murdered tsarevich becomes a hallucinatory spectre that hounds Boris to his death. Following Karamzin, most 19th-century Russian historians continued to present Boris as responsible for Dmitry’s death. But Boris found defenders and apologists. The most authoritative of these was Sergei Platonov, a respected historian of the Time of Troubles. In Platonov’s opinion, Boris was the victim of unsubstantiated slander; it was his tragedy that he became tsar at a time when Russia was faced with a series of insoluble crises; and it was the duty of historians to bring about his moral rehabilitation. Since Platonov’s time most historians have tended to give Boris the benefit of the doubt. They have concluded that the case against him in relation to the death of Tsarevich Dmitry is unproven, and the evidence is circumstantial. Nevertheless, the circumstantial evidence is strong. Boris’s guilt is of course both unproven and unprovable, but the gap between historical reality and his traditional reputation as a child-murderer may not be so great as his apologists have suggested. Whether he suffered the pangs of conscience for his crime is, of course, another matter altogether. This is an edited extract from Maureen Perrie’s article ‘The Ruler and his Reputation’ for The Royal Opera’s programme book for Boris Godunov, available to buy during performances. Boris Godunov runs 14 March–5 April 2016. Tickets are still available. The production will be relayed live to cinemas around the world on 21 March 2016. Find your nearest cinema and sign up to our mailing list. I had heard that in the Orthodox faith men, kings included, were allowed only four wives, even after the deaths of the women. This would mean that the Tsarevich Dmitri would be counted as illegitimate and not a serious contender for power; therefore safe from murder. Thanks for your comment. In fact, Professor Perrie discusses this in the full version of her article, printed in the programme – of how the fact that Dmitri's legitimacy would have been questionable in the eyes of the Church was part of Platonov's defence of Boris.